If you have music actively playing, or a song or iTunes Radio station is paused within the Music app, you can quickly jump to the Music app by going through the Control Center of iOS. 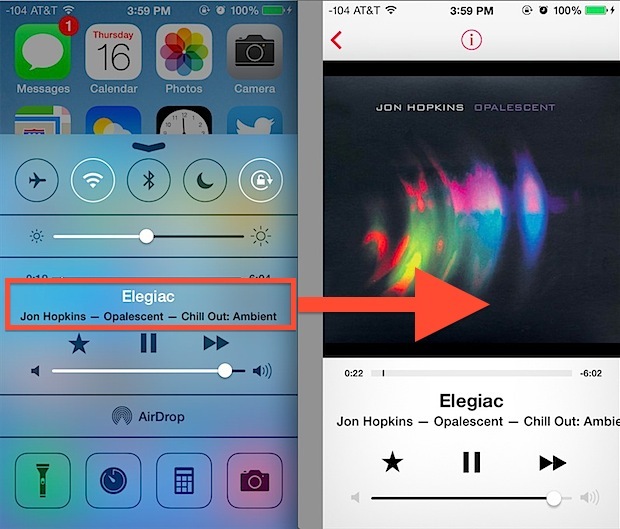 In many cases, this lets you adjust songs or radio stations quicker than using the multitasked to switch apps. This is a fairly simple trick, and those who listen to a lot of music on their iPhones and iPads should appreciate the convenience. This is helpful if you want to do more than what’s immediately available in the music controls of Control Center, whether that’s changing albums, artists, or radio stations, or making adjustments to the currently playing iTunes Radio channel. Though you can access the Control Center from a locked device, the ability to jump into the Music app is constrained to Control Center usage from either the Home Screen or within an app. That means this will not work on a passcode protected lock screen, though you can still play music and skip stations from the locked screen (assuming it hasn’t been disabled), the Music app is inaccessible in that state. Works for podcasts using the podcast app as well.